Getting the most out of both your instruments and computer when doing recording, mixing and producing is achieved easily by having a good audio interface. Having clear audio signal, enough inputs and outputs, and a lag- free experience is what defines the best audio interfaces out there. However, with loads of different features, specifications and parameters to look for, getting the right one for your needs can be a bit hard. That’s why we’ve decided to compose this article as the best audio interfaces buying guide and our pick of the top 10 best ones on the market. Simple yet efficient, Scarlett 2i2 by Focusrite definitely shows that you don’t have to spend a lot of money in order to get more than a decent audio interface. Featuring a nice makeover since the previous generation of this device, the 2nd Gen Scarlett Audio Interface rocks 2 microphone/ instrument inputs. A flip of the switch tells the device which type of input you’re using and adjusts the gain and levels accordingly. There are, of course, separate gain controls for both channels, as well as a monitor volume knob. You can even toggle between using the direct monitor option, and with a separate level knob, you have the control over the volume on your studio monitor headphones. Scarlett 2i2 connects via USB on the back of the device and offers a high-speed connection of 192kHz and 24 bit. Latency isn’t a problem for this Focusrite interface, so you can fully concentrate on the project you’re working on. 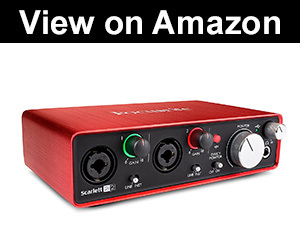 Focusrite Scarlett 2i2 is a minimalistic yet very versatile audio interface which is very easy to use and master. At around $150 it is a great option for anyone looking for the best USB audio interface for their home studio. Another minimalistic and simple approach to audio interfaces is the Presonus AudioBox 22VSL. This bad boy also packs 2 combined inputs, for microphone and instruments. Both channels have their own level controls, as well as a useful 48 volts phantom power switch for those power hungry devices you might want to use. 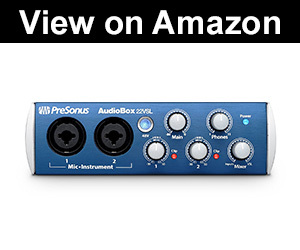 What the Presonus audio interface offers is two high-quality pre-amps inside a sturdy and well- designed steel body. The front sports a main volume knob, headphones volume knob, and a mixer knob for blending in the right amount of input and computer playback signal. The back of the Presonus interface offers a standard USB 2.0 connection, both MIDI input and output, stereo main out and headphone output. Unlike the Focusrite Scarlett, this device supports midi controllers, making it great for using keyboards or drum pads. As it comes with Studio One Artist, you’ll be covered when it comes to a “free” DAW as well. All things said, the AudioBox 22VSL satisfies all the needs an amateur sound engineer could have. With its performance, build quality and specs, it’s definitely the best audio interface for under $200. Although this interface is both PC and Mac compatible, we felt it was the best one to combine with Apple computers. 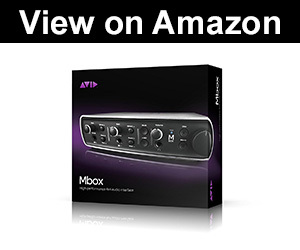 If working in Pro Tools is your thing, definitely consider the Avid Mbox. It comes in a rather nicely designed body and packs quite a punch. The front of this device offers all the needed controls, such as a big master level knob, headphones volume, separate channel controls as well as 2 useful buttons. The first button is labeled Dim, and by pressing it, the device lowers the levels of both the headphone and the main output by 30dB. The Mono button simply changes the stereo output to mono. Both of the inputs on the front of this USB interface have their own dedicated gain knobs, which when pulled engage a -20dB pad. As there are two Mic/Line inputs on the back of the device as well, pressing one of the buttons on the front toggles between controlling the front and back inputs. Having MIDI I/O options besides 4 channels, alongside standard monitor outputs and S/PDIF input and output rounds this device quite nicely. Avid Mbox is a great audio interface to get for upgrading your semi-pro music studio. As it is compatible with most DAWs out there, it’s guaranteed to do a very good job. The Onyx Blackjack by Mackie immediately stands out with its unique design. The angled surface gives you a clear view of the knobs and LEDs at all times. All of the inputs and outputs except the headphone output are located on the back of the device, making the front very clean and accessible. This USB interface is unique as it features Onyx preamps which give a good boost to the sound and maintain clarity quite nicely. As one of the best cheap audio interface solutions, the Onyx Blackjack rocks a straightforward and simple panel with just the crucial controls. As probably the best audio interface under $100, the Mackie Onyx Blackjack manages to have all the necessary features and specs for basic recording needs while using up so little space on your desk. A definite recommendation for anyone looking for the best affordable audio interface with a small footprint. Coming from the same folks that gave us the now famous Cubase DAW, the UR22 MKII may look like just another plain interface, but it actually has some very useful and neat features. Packed in a rather small body is a powerful audio interface. Not only is it compatible with PC and Mac, but with iPads as well. The front of this device houses two combined microphone/ instrument inputs with their respective gain controls. A mixer for blending the input and DAW signals alongside headphones and output level knobs makes controlling your mix a piece of cake. Rocking MIDI I/O as well as the option of using it with an iPad makes it not only the best audio interface for DJ needs, but the best audio interface for voice over needs as well, as you can take it anywhere you need, perfect for those YouTubers and musicians that travel a lot and want to do their work on the go. Cubasis (iPad app) and other DAW compatible, the UR22 MKII is a portable yet versatile audio interface. 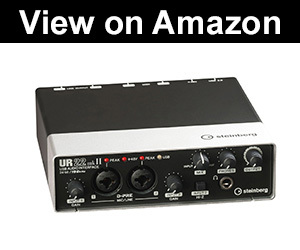 All things considered, the UR22 MKII by Steinberg is the go- to USB audio interface for musicians on the move. Now let’s take a look at the Scarlett 18i20, the Focusrite audio interface that every professional recording studio should have. This beast of a device supports 8 inputs and 20 outputs and handles the signal with no lag or latency. The front of this interface rocks 2 combined inputs, as well as all the level controls for 8 of the channels. A handy LED shows the levels of the mentioned channels, and on the right-hand side, there are two separate headphone jacks, each with their level knobs. A master monitor knob alongside dim and mute buttons makes mixing and recording very easy and straightforward. The back is where the Scarlett 18i20 shows its power. Alongside the inputs, for channels 3 through 8 are 10 outputs which include standard monitor ones. Midi is of course supported, as well as S/PDIF in and out. What makes this studio interface stand out is the option of connecting other devices via optical cables. This not only gives you the ability to expand the number of linked devices, but also a very fast connection between them. As one of the best audio interfaces for professional use, the Focusrite Scarlett 18i20 is the premium solution for anyone looking for the best rack audio interface. 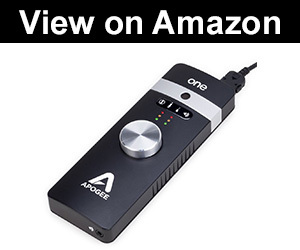 With laptop and iPad users in focus, the Apogee ONE is the best portable audio interface out there. Although the Steinberg UR22 MKII offers a great level of mobility, it doesn’t get much more portable than the Apogee ONE. The device itself rocks a dongle- like form factor, and a very simple design and interface. There is only one knob for controlling the level, and two sets of small LEDs which display microphone and guitar levels. The device also features a built-in studio-quality condenser mic, perfect for a quick idea or vocal recordings. Besides being very practical for basic recordings, it is regarded as the best audio interface for podcasting, due to its lightweight design and minimalistic approach. The included adapters support an instrument and mic input. If you’re constantly on the move but still want to record your songs, the Apogee ONE is your best option as one of the best audio interfaces in terms of minimalistic design and unparalleled mobility. Coming from the same company that brought us Guitar Rig, Komplete Audio 6 is regarded as the best audio interface for home studio occasions, as well as for some professional applications. The device itself looks absolutely amazing. The front houses two microphone/ instrument inputs with toggles and level pots. Monitor volume, a mono switch and a headphone output with level controls are also there, neatly organized for maximum efficiency. The top, however, is where the magic happens. A huge main volume knob sits in the middle, surrounded with LEDs indicating active channels, MIDI activity as well as which channels are being monitored. On the back, you will find standard MIDI and S/PDIF I/O, and two more inputs and 4 outputs. Sound quality is above average, and no lag or latency is present. The best thing about this audio interface is the software package that comes with it, as it includes Cubase, Traktor, and Komplete Elements, which is a wonderful addition to this sturdy and versatile device. All things said, the Komplete Audio 6 is a great investment, especially if you consider it costs around $200. Definitely one of the best audio interface solutions for vocal recording as well as instruments. 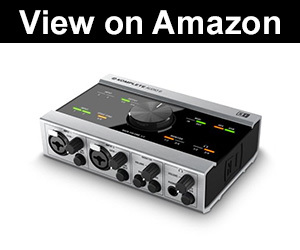 Maintaining a rather compact and small form factor as the Apogee ONE, the UCA202 by Behringer captures all the important specs and features you may need, in an audio interface you can put in your pocket. As straightforward as it gets, the device is powered via USB exclusively which adds to the portability. The inputs and outputs are all RCA, so you will need a couple of adapters in order to connect your devices and instruments. A simple volume wheel and on/ off switch to make using this interface a piece of cake. There is also a headphone output as well as an optical output, something you can rarely see on interfaces this small. If you’re in need of a good audio interface but can’t spend a lot of money, definitely check the UCA202 out. As it only costs around $20, it’s one of the best budget- friendly interfaces on the market. At number 10, we have yet another product from Focusrite, but this time as the best firewire audio interface. The Saffire Pro 40 offers professional audio quality as well as amazing durability. The front houses 2 microphone/ instrument inputs, all the necessary controls, 2 headphone outputs, as well as LED indicators for the different channel levels. On the back, there are 6 more inputs alongside 10 line outputs, MIDI I/O, firewire connections and optical I/O. You definitely won’t lack any connection type with the interface. What makes the Saffire Pro 40 special are the award-winning pre-amps, making it the best 8 preamp audio interface on the market. High- quality audio is easily managed with the comprehensive software package that is included. 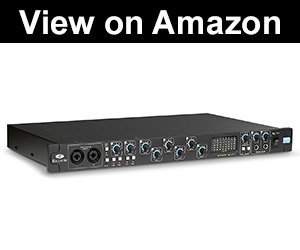 For just under $300, the Saffire Pro 40 is a recording interface meant for professional producers and sound engineers. All things considered, it’s definitely worth the money. What to look for in a great audio interface? As with any piece of your studio equipment gear, you have to be extra careful when buying something new. In order to get the most out of the device, you need to double check if it’s going to work with the rest of your setup. Here, we are talking about the type of connection the audio interface uses for connecting to your computer. Though there are various adapters you can get, some cables and connection types just require a specific port to operate. USB – Very widely used, mostly because you can find USB ports just about anywhere. The main downside of this type of connection is that the data transfer is the slowest amongst the others used in audio interfaces. It’s usually the cheaper devices that utilize this type of connection. Firewire – Though slowly becoming less commonly used, this port allows for faster data transfer rates than USB. It minimizes the chances of latency and lag, but again, double check if the computer you’re using supports this connection type. Thunderbolt – Commonly associated with Apple products, this port is becoming more popular with other devices as well. It provides even faster data transfer speeds than both USB and Firewire and supports multiple devices with no degradation of quality and speed. It’s used frequently in newer, a bit more expensive interface solutions. PCIE – If you have a PC, your motherboard has a PCIe Just make sure that you have one that isn’t already being used, and that there is enough space to fit your new device. When it comes to speed, it doesn’t get much faster than this. After reading this, USB may seem like the least practical option. However, have in mind that it’s, in most cases, fast and reliable enough for most recording needs. With technological advances as USB 3.0 and type- c being used more often, higher transfer speeds are now easily achieved, making this connection type a good option. From simple devices offering one standard audio or XLR input, to the more professional ones with dozens of them, there are loads of different devices which suit different needs. Think about the rest of your setup, and how many instruments and devices you’re going to be using at the same time. Going for a hybrid input type, which offers both XLR and standard audio input is a great way of saving money if you plan on recording both instruments and vocals, but don’t need to do so at the same time. Remember that the more I/O connections the audio interface have, the more expensive it will be. If you plan on expanding your rig as time goes by, it’s smarter to wait, save up more money, and invest in an interface with more inputs, than having to buy a new one in a few years time. Drums easily eat up around 10 channels, so if you’re planning on recording them, have this in mind. Generally speaking, most DAWs are compatible with most audio interfaces. Sure, there are some exceptions, or combinations of these two that can be a bit problematic and require hours of mapping and setting things up. If you haven’t chosen a DAW yet, and plan on doing so after you’ve bought an audio interface, it’s much easier to find the right one. Your best bet would be to use both an interface and DAW from the same company. This way they’re guaranteed to work alongside each other, and you don’t have to think about future compatibility with new updates. That does limit you in a way, but you can always try combining other DAWs you may find more useful for the device you already have. Chances are they are going to work just fine. As the audio interface is a crucial piece of your equipment, you’re gonna want to keep it somewhere you can easily reach it and use it with ease. Desktop Audio Interface – Relatively compact, meant to sit on your desktop. 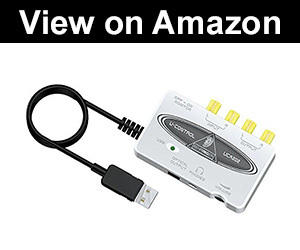 Convenient for having it next to your keyboard and ready to use, but offer fewer connections. Rackmounted Interface – As the name suggests, this type of interface goes on a rack with all the other devices you might have. They are bulkier and take up more space, but at the same time are more versatile and offer more connections. Portable Interface – Small and compact, offer fewer inputs but are practical for traveling and using them with a laptop or similar devices. As a home studio solution, your best bet would be a desktop interface. Chances are that you already have your desktop crowded with your keyboard, mouse, speakers, a MIDI controller or similar devices. On the other hand, a rack-mounted interface is a great way of keeping things neat and organized in a more serious, professional studio environment. And probably the most important factor, as it can be a definite dealbreaker for some, the price. Higher sound quality, faster data transfer, and more connections equal a more expensive audio interface. Give it some time. Think about your plans. Are you going to record a band or just a guitar and vocals? How serious are you about recording and producing? Take all these things into account, and save up more money if you think it’s worth it. It’s always way smarter to buy an audio interface that is going to get the job done even after a couple of years than buying a cheaper one you’re going to replace after a short period of time. As you’ve had the chance to see, there are definitely different ways companies approach audio interfaces. Though every model we’ve suggested so far has its own pros and cons, some performed a bit better than the others. 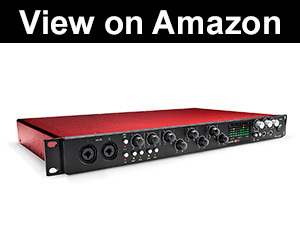 As The Best Audio Interface, we’ve chosen the Focusrite Scarlett 2i2 for its great audio quality and usability. The best Audio Interface for MacBook Pro and other Apple products would have to be the Avid Mbox as the best device to complement the powerful hardware of your laptop. Being on a Tight Budget doesn’t mean you can’t buy a good audio interface. 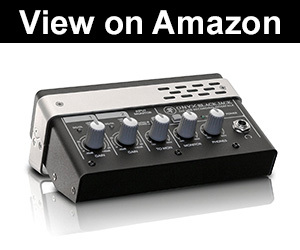 Our choice is the Behringer U-Control UCA202, with great quality at a low price. The rest of the mentioned interfaces are a great choice as well, depending on what you value the most.